Put the cauliflower into a large saucepan and cover with boiling water. Cook for 5 minutes or until tender. Drain really well then allow to cool. Once cold enough to handle, chop them up into small pieces and set aside. Pour the milk into a saucepan with half the flour and add the butter. Whisk together and slowly bring to the boil whilst mixing all the time, until smooth and thick. Add the cooked cauliflower and cheddar to the mix, stir well and season to taste with salt and pepper. Leave to cool in the pan. Once the mixture has cooled, spread it out on a large sheet of oiled cling film. Roll into a long sausage shape and wrap tightly in the cling film. Chill in the fridge for at least an hour or overnight. Preheat the oven to 200Â°C/180Â°C Fan/Gas mark 6. Tip the remaining flour onto a plate and season with salt and pepper. On another plate, mix together the breadcrumbs and the parmesan then put the bowl of beaten egg next to it. 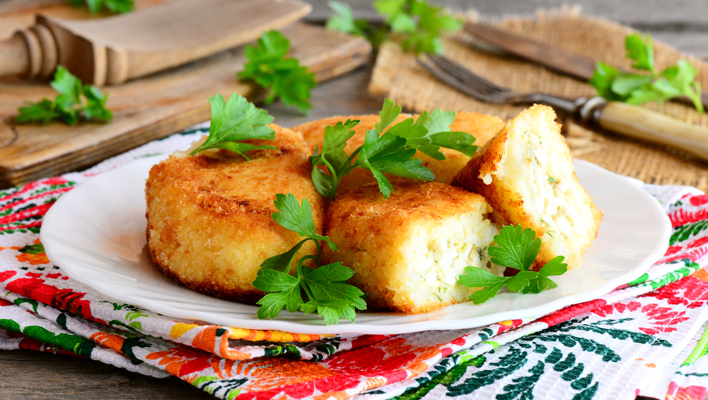 Unwrap the cauliflower filling and divide into 12 small sausage shapes to form the inside of the croquettes. Put each one into the flour first and roll them to coat. Next dip them in the egg followed by the parmesan crumbs. Place the croquettes on a lined baking tray and cook for 15-20 minutes until golden. Place the parsley, coriander, onion, mushrooms, chilli and garlic into a food processor and process to a coarse purée. You may need to add a little water. In a separate bowl, add the vegetable purée, mince and herbs – mix together and allow to set for 2 hours in the fridge. Tear off 5 sheets of foil (about 12" each). On the foil, roll an 8" sausage with the mixture. Push a 12" skewer into the middle, fold the meat back over. Roll up the foil and then roll on the worktop to make a rounder shape and then to seal the meat to the skewer. 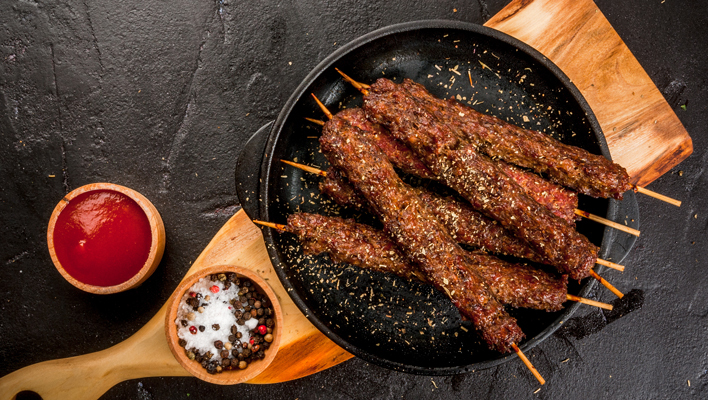 If you are freezing the brochettes, squeeze the ends of the foil round the skewer. 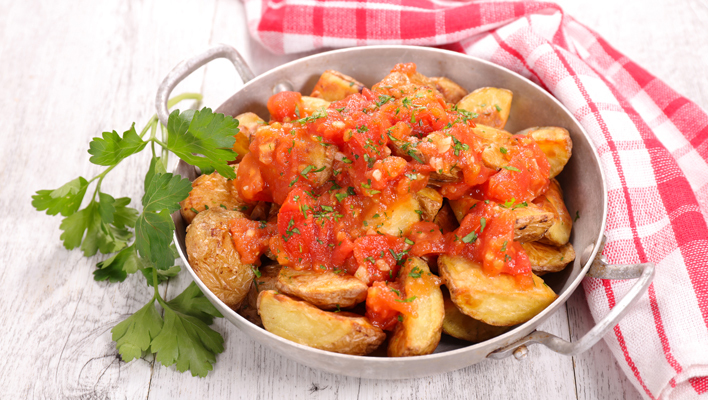 Bring a pan of salted water to the boil, add the cubed potatoes and bring back to the boil. Reduce the heat and simmer gently for 10 minutes or until just tender. Drain and leave to dry out in a colander. Heat 10ml of olive oil in a large frying pan over a medium heat. Add the potato and fry until golden and crisp (about 15 minutes). To make the dressing, heat 1 tbsp of olive oil in a small frying pan over a medium heat. Add the garlic and chilli and fry for 1 minute. Add the chopped tomatoes and paprika and continue to cook for about 5 minutes until the tomatoes are softened but still retain some of their shape. Season to taste, then add the sage, remove from the heat. Add the potatoes to a serving bowl and top with the dressing. Roast the pepper in the oven for about 10 mins or until just beginning to soften, then set aside to cool. 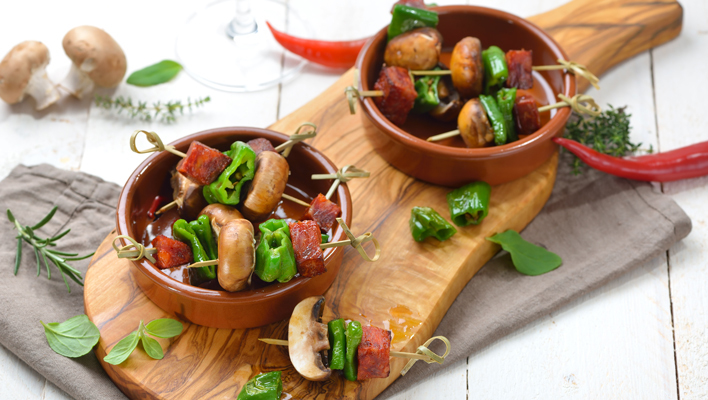 Thread a chunk of chorizo, pepper and a mushroom onto bamboo skewers. Place on a parchment-lined baking tray, cover and chill (up to 8 hrs). To make the dip, mix all the ingredients in a bowl, cover and chill. When ready to serve, heat the oven to 200°C/180°C fan and bake the skewers until the vegetables are softened and nicely browned, and the chorizo slices are cooked through (approximately 10 minutes). Serve with the dip and enjoy! Firstly, combine the paprika, cumin, coriander, thyme, garlic, oil and vinegar in a large bowl to create a marinade. Add the chicken and coat. Cover and chill for at least 2 hours (best when chilled overnight). Combine all the dipping sauce ingredients in a bowl – cover and chill. Meanwhile, soak 16 wooden skewers in water for 30 minutes (this will prevent them from catching during cooking). Preheat the grill to medium-high. 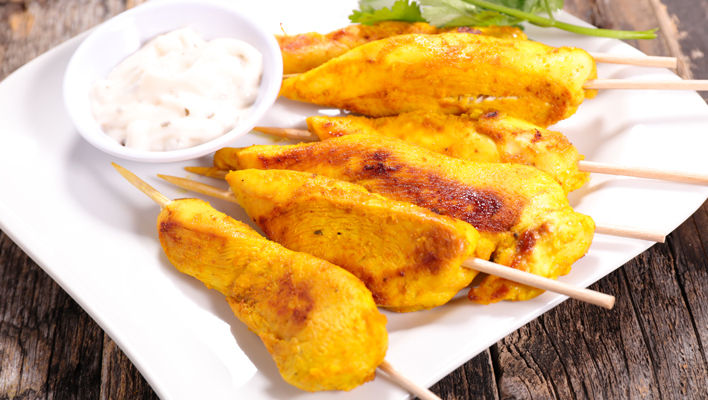 Thread the chicken onto the skewers and arrange in a single layer on a baking sheet. Grill the chicken for 5 minutes on each side, or until cooked through. Serve with the dipping sauce and extra lime wedges if you wish. Heat a large frying pan and spray with Frylight. Add the onion, pepper and garlic until soft. 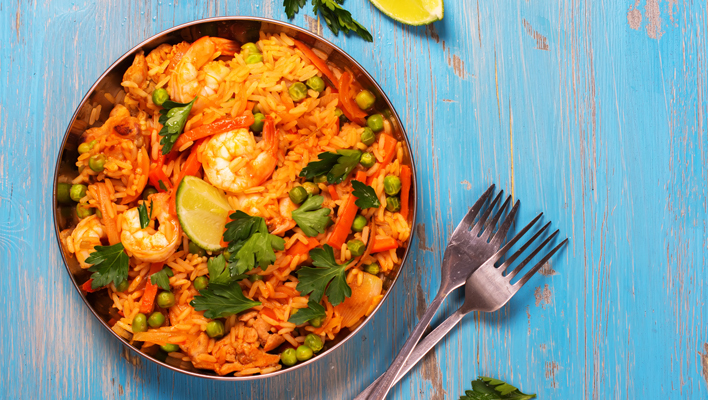 Add the rice, saffron and paprika and give it a constant stir for about a minute to mix well. Pour in the stock and simmer for 15 minutes until tender (add more water if you need to). Add the prawns and peas for the last few minutes until heated through. Stir through the parsley, add some seasoning to taste if required and serve with the lemon wedges.